It has been a very cold winter in Texas. Winter was still not over the last week of February, but since it had been 3 months since we took the trailer out, we were getting anxious to get back out again in it. 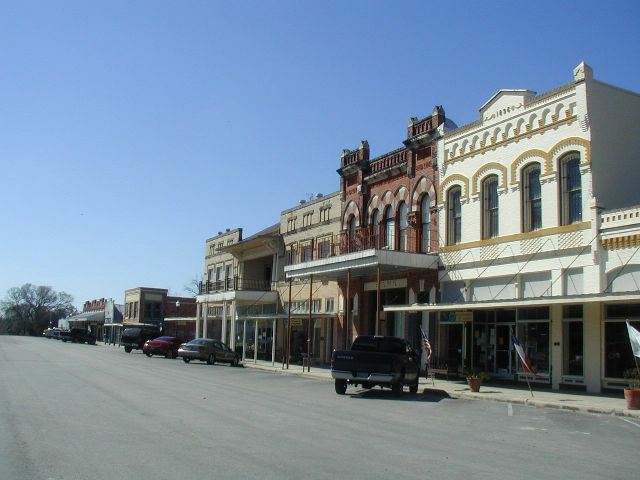 We decided to head south from Houston and try the weather in Goliad to see if it might be a little warmer. Unfortunately, winter fallowed us to Goliad. We did get a few days that were nice and allowed us to visit the sites from Texas history that are in the area. 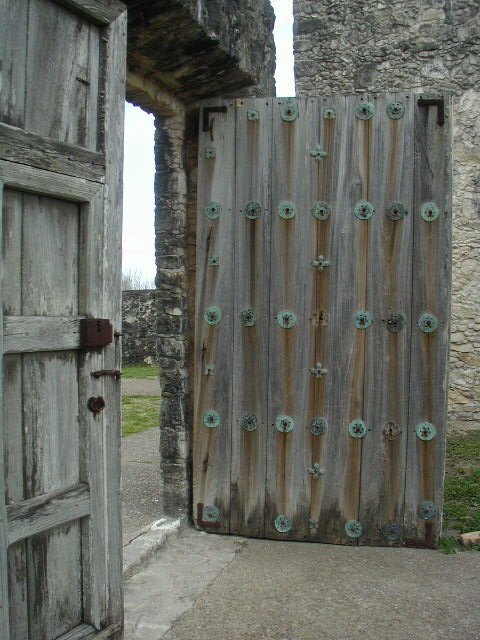 The Goliad area is the bulls eye of activities leading up to the formation of the Republic of Texas. It is said to be the birthplace of Texas Ranching. We hope you enjoy our comments and photographs. [Monday] February 22nd we left home about 10 am, and drove down US-59 south from Houston. 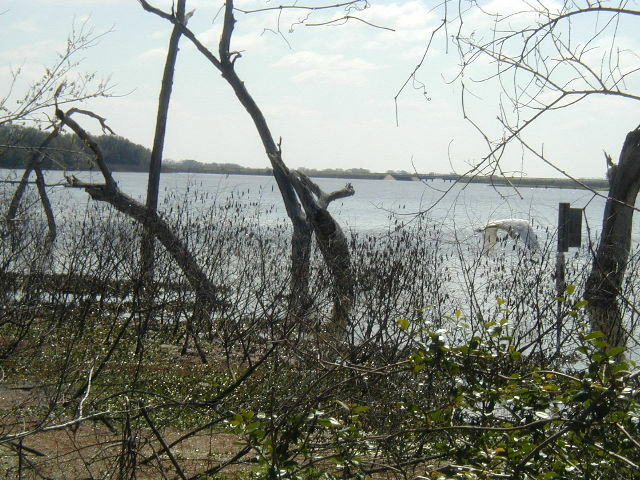 We stopped on the south shore of Lake Texana at a deserted public boat launch and enjoyed lunch with a nice view of the upper part of the lake and the Navidad River. We continued on US-59 past Victoria and stopped around 2 pm at Coleto Creek Park and Reservoir. 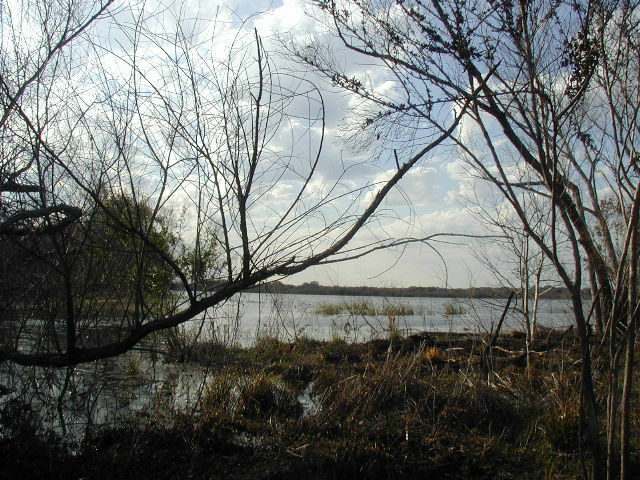 The 3,100-acre lake and park is run by the Guadalupe-Blanco River Authority (GBRA) and is a popular home for "Winter Texans" that like to freshwater fish. 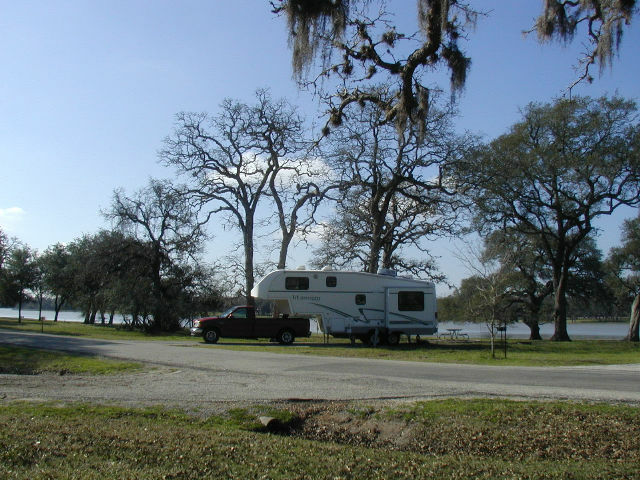 It is a nice park for fishing and boating because many of the RV sites allow you to dock your boat right behind your trailer. We camped in site #24, which had a good view of the lake. After a short rest, we hiked down the bike trail, which winds around through woods along the shore of the lake. We saw many deer and lots of birds. Wind from an approaching cold front was blowing briskly. < Our campsite at Coleto Creek Park. < Coleto Creek Reservoir. [Tuesday] This was a cold, cloudy, windy, rainy day that kept us shut up in the trailer. Outside the temperature stayed around 40 degrees and a strong wind off the water sent wind chills to near-freezing. It was not a good day for outdoor activity. [Wednesday] The morning temperature was 38 degrees, but the sun was bright in a cloudless sky. After breakfast we drove the 13 miles further into Goliad and after a stop at the Super S grocery, we settled into site #11 at Goliad State Park. 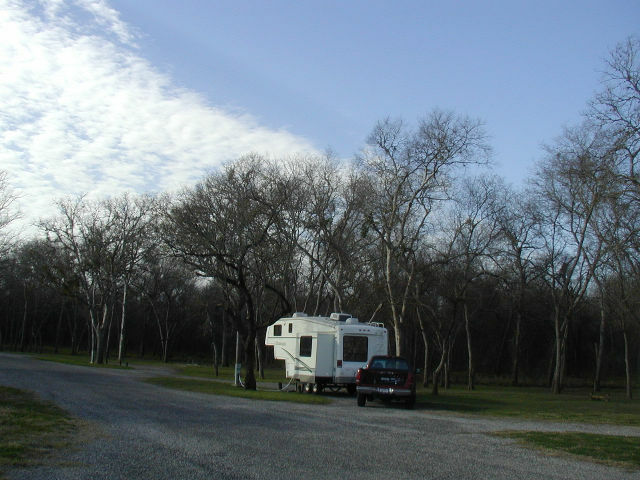 < Our campsite at Goliad State Park. 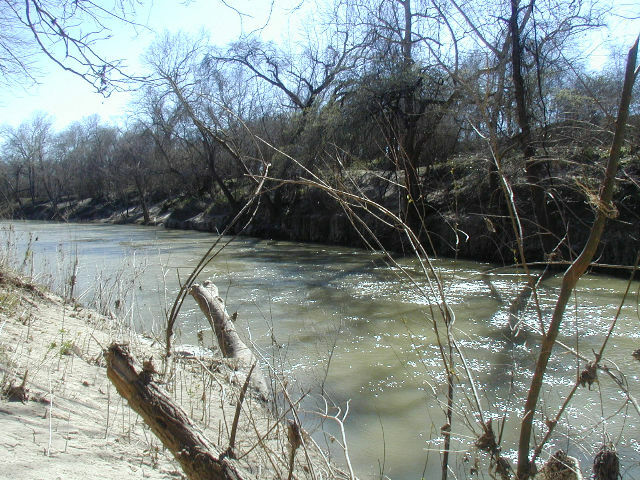 Goliad State Park is located one-half mile south of Goliad on the San Antonio River. 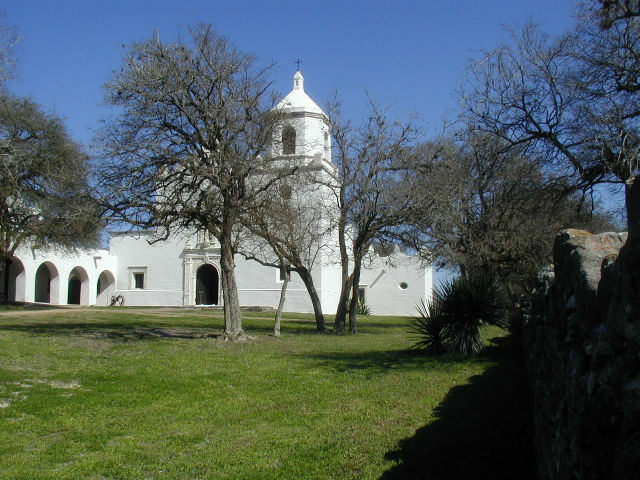 The park serves as a hub for visiting the Mission Espiritu Santo (located in the park), the Presidio La Bahia & the Ignacio Zaragoza Birthplace (1/4 mile south of the park), Fannin Battleground (9 miles east), the Goliad Historic District and Mission Rosario (4 miles west). 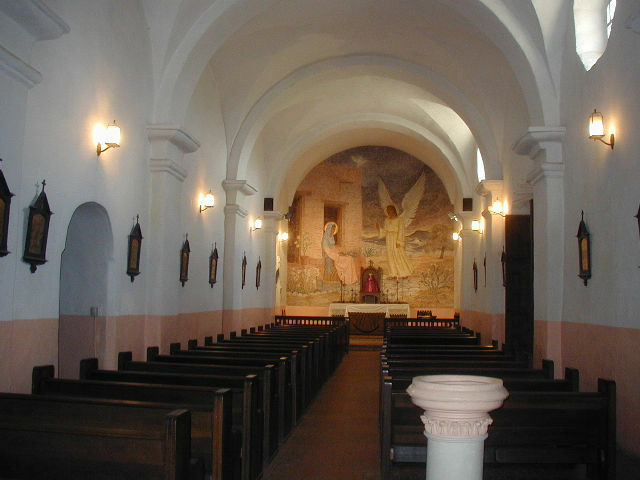 The State Park was constructed and the Mission Espiritu Santo was restored in 1935-41 by the CCC. Three hundred years of Texas history are revealed in these sites. After lunch, we walked over and toured the Mission Nuestra Senora Del Espiritu Santo De Zuniga and grounds, including the Museum. 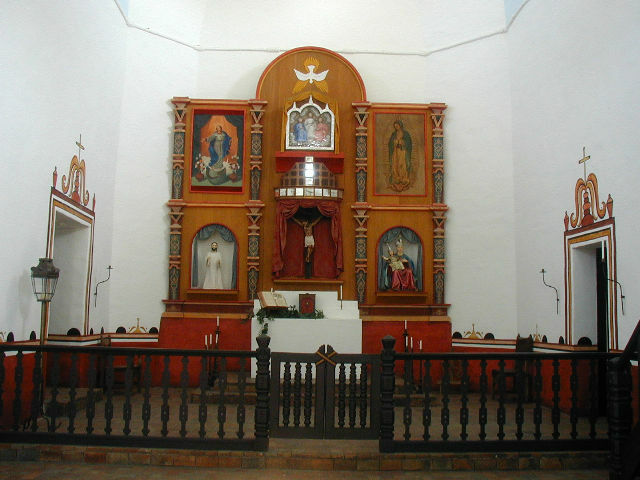 The Mission was established by Franciscan priests at Matagorda Bay in 1722. In 1749, after two other moves, it was relocated to it's current site on the San Antonio River, protecting Camino La Bahia, a major Spanish trade route to the north and east. 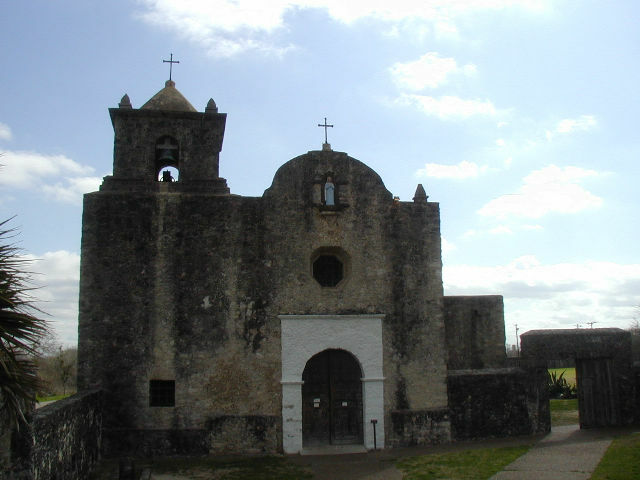 The mission operated until 1830 to convert the native Indian tribes to Christianity. Declining Indian populations, lack of money and political turmoil in Mexico forced it to close. 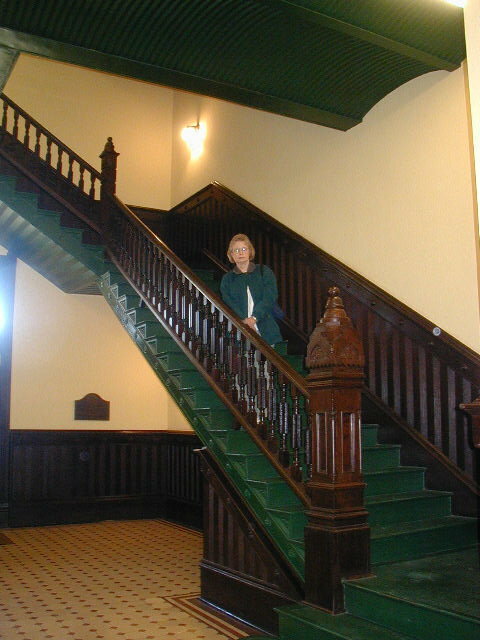 During the 1970s, TP&WD rehabilitated the chapel and built exhibits in the restored granary. 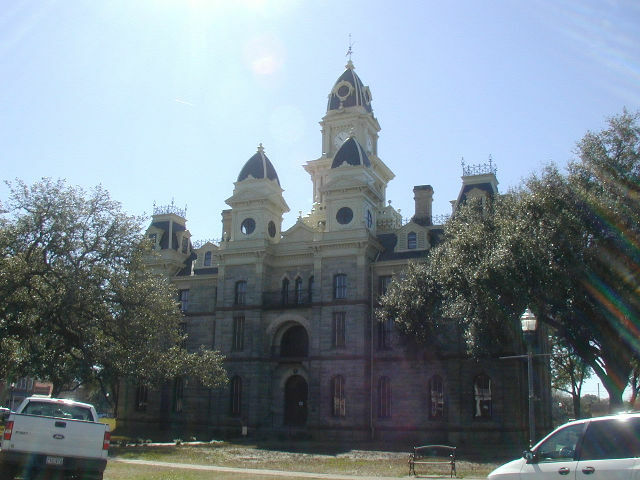 [Thursday] We drove the short distance into Goliad and checked out the Courthouse and some of the Antique shops around the Courthouse square. 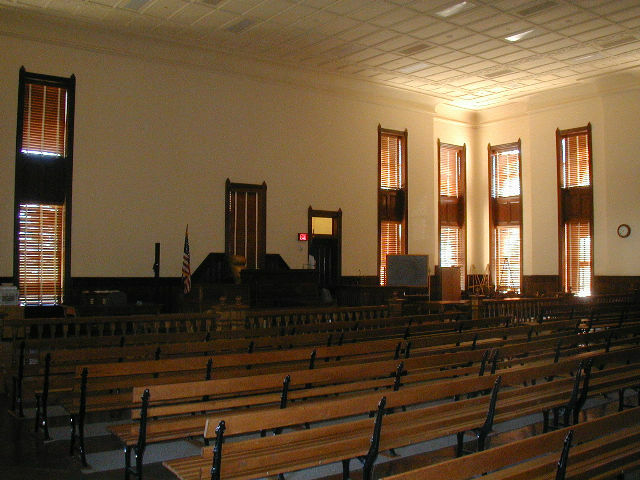 The old buildings are in great condition and most are in use today. We found many opportunities to shop. After lunch we hiked on some of the State Park trails. The trails along the San Antonio River were closed because they were still wet from the river flooding earlier in the month. We were still able to enjoy many birds and a portion of the river. 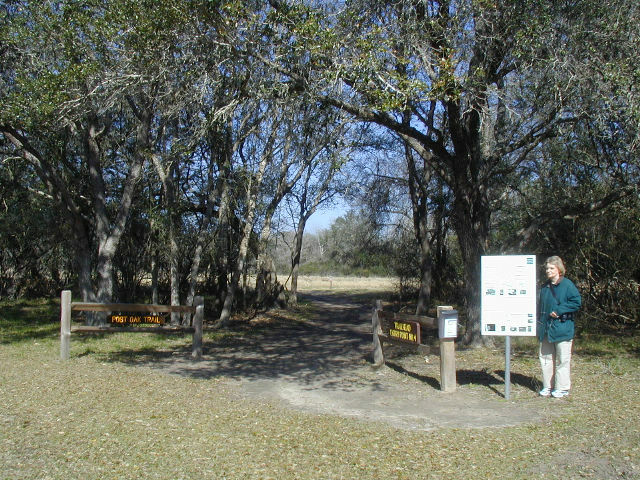 < Aranama Trail entrance. < San Antonio River in Goliad State Park. [Friday] In the morning we drove about 1/4 mile and toured the Presidio La Bahia (The Fort of the Bay). It is considered to be the world's finest example of a Spanish frontier fort. This is the most fought over fort in Texas history, having seen participation in six National Revolutions/Wars for Independence. 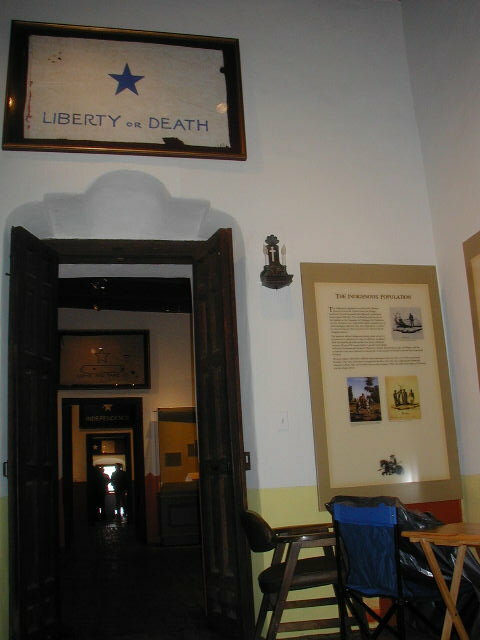 The fort was established by the Spanish in 1721 to respond to an encroachment by the French into the Spanish Province of Texas. Originally on Lavaca Bay on the site of the ill-fated French Fort St. Louis built by La Salle, it was relocated in 1749 to the present location. Spanish soldiers in this fort protected the Mission Espiritu Santo, located a half-mile north. 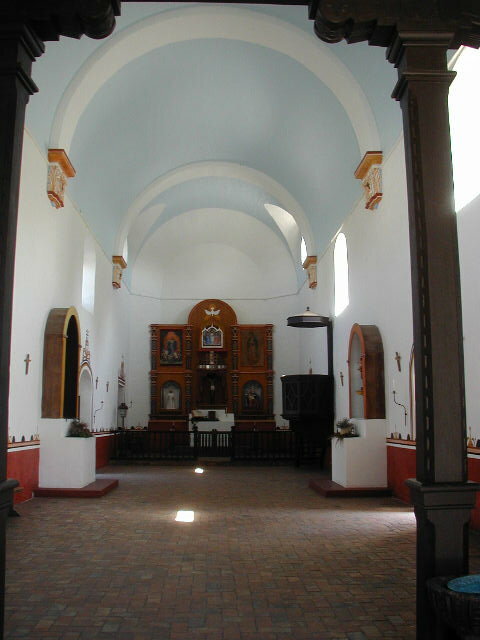 Within the Presidio is a Museum and a Catholic chapel that is still in use today. Located about a block away from the fort is a monument to Colonel James W. Fannin and the men of his command that were killed in the Presidio La Bahia by the Mexican Army under direction from Santa Ana. 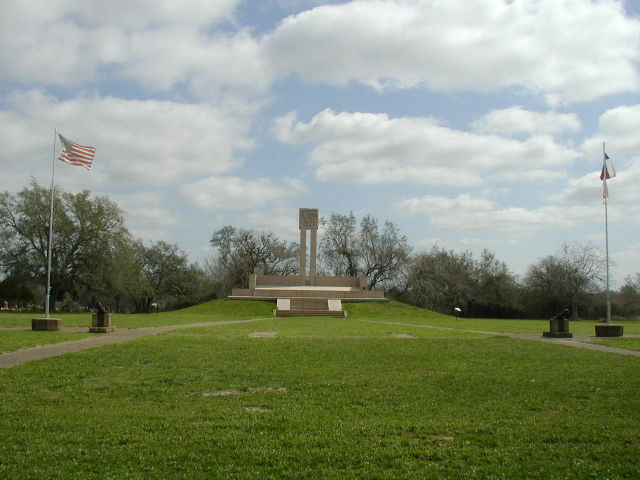 There was twice as much loss of life at Goliad as at the Alamo. 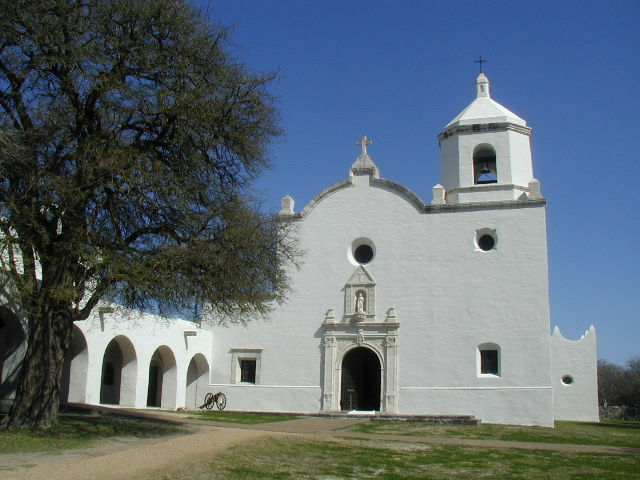 News of the Goliad Massacre enraged the people of Texas against Santa Ana. 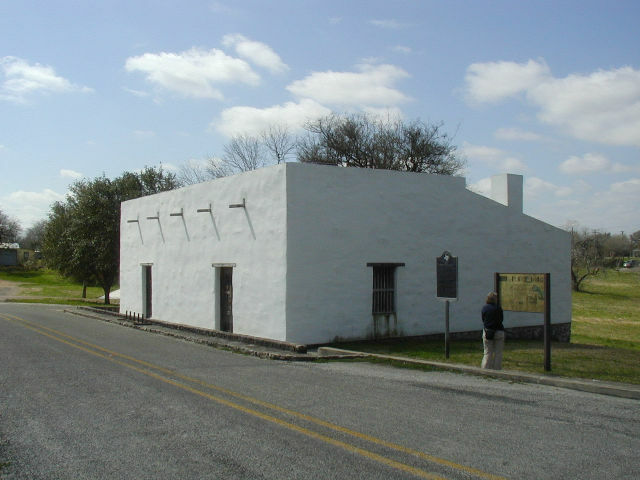 Across the street from the fort is the birthplace of Ignacio Seguin Zaragoza, a Mexican hero. As a general in the army, he was victorious over the French at the Battle of Puebla and is celebrated today with the Mexican holiday of Cinco de Mayo. 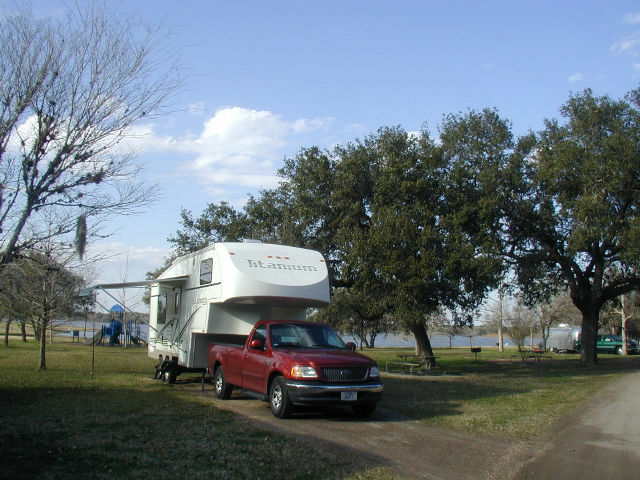 After lunch, we left Goliad State Park and headed east on US-59 and after a stop at HEB in Victoria, we continued east to Lake Texana State Park, where we arrived around 4pm and set up in site #131. Even though the temperature was in the 60's outside, the wind was so strong (25-30 mph) that we stayed in the trailer the rest of the day. 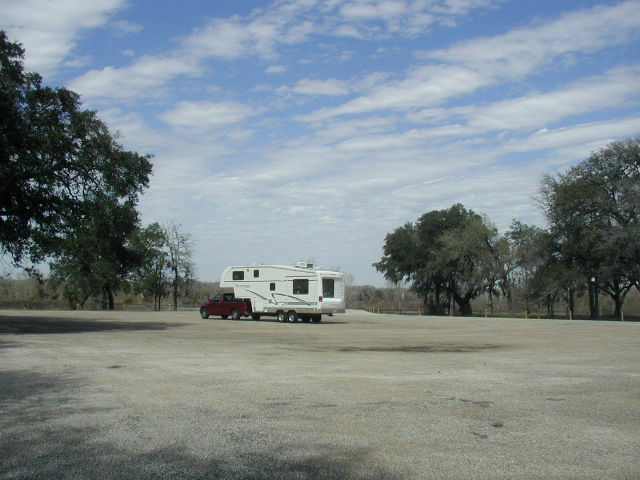 < Our campsite at Lake Texana SP. 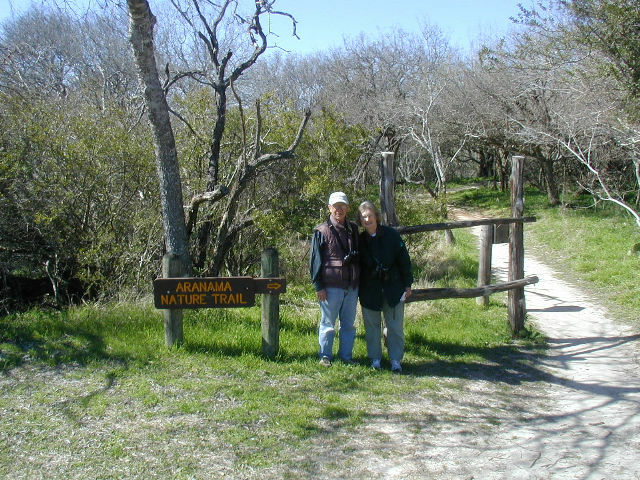 [Saturday] Today was a nicer day and after breakfast, we hiked the Texana Trail that is about 1 mile long. We saw several variety of birds and several deer. After lunch, we drove back east on US-59 to our home in Richmond, arriving mid-afternoon. This draws to a close our visit to the Goliad Texas area. We hope you enjoyed the photos and brief descriptions of our activities. God willing, join us again soon for another RV adventure.